Best Bathroom Exhaust Fan Reviews – Clear Your Bathroom Fast! You know those long, relaxing showers that you enjoy after a long day at work? Well, those relaxing showers can be a time bomb waiting to explode. By that I mean all of the humidity and the moisture from your showers, all in a concentrated space, which happens to be your bathroom, can create the perfect storm for mildew and mold. This mildew and mold can then lead to damage to your walls, the wood framing, and if bad enough, can even affect your health. Luckily for you, there is a silent protector and best friend against this, your best bathroom exhaust fan. This little fellow works non-stop to remove any excess odor, moisture, and even some mold spores. Which on a side note if you don’t have a bathroom window, then having the best bathroom ventilation fan is an absolute must. That is why I have come up with the 10 best bathroom exhaust fans review. Enclosed Condenser Motor: Even with the high power enclosed condenser motor, you will still barely even know that it is there. It is both powerful, yet quiet and will definitely be able to keep the steam from building up in your bathroom in just about any situation that you can think of. Sturdy Housing For Long Lasting Use: With a fan housing that is made of heavy-gauge zinc galvanized steel, this fan is one that will last the test of time. There were no corners cut when this fan was put together. The tough housing is easy to install and tough enough for any bumps and bruises that may come its way. Just The Right Size for Any Job: With a duct diameter of 6-inches and rated at 290 cubic feet per minute, this fan will exceed any and all expectations that may be there. Being big enough to know it’s there, but small enough to not become an eyesore, the mounting opening of 12 3/16” is the perfect size to not just be functional, but also be stylish and practical. Designed For Efficiency: There is no other way to say it; this fan was simply designed with efficiency in mind. With the wide blower that was designed to move air from both sides, this fan is not just going to get the steam out of your bathroom in a hurry. As Quiet As Can Be: The Panasonic FV-30VQ3 WhisperCeiling 290 CFM Ceiling Mounted Fan was designed to be as quiet as possible. From the uniquely designed intake system to the flush mount installation, this is a bathroom fan that you won’t even know is working when you’re in the bathroom. After I installed and tested the fan, it was pretty much as advertised. The fan is not the smallest that I have ever seen but is also flush mounted to the ceiling and not overly large either. The one thing that I did have a little trouble with is that the bathroom fan I replaced it with had a smaller vent duct. My old fan was only 4,” and this fan is 6”. So there was some trouble with the installation in that sense as the 2” difference in vent size did pose a problem at first. But once that situation was handled, and the fan was installed, it did work great. It was pretty quiet and even testing it with the water turned up as hot as possible to create as much steam as I could, the fan was still able to keep up with the demand to remove it all. This was definitely in the running for the best bathroom fan. What I would change if I could change anything, however, would be to make the installation easier. While I did have to deal with the difference in air duct size, that is not what I would change as that happens. My big problem was with the location of the wiring box. If they could change this to be more practical, that would be great. The NuTone 9093WH Deluxe Heat-A-Ventlite Heater with Ventilator and Incandescent Ceiling Light is both a bathroom-ceiling fan, as well as a bathroom light. It brings both functionality, as well as style to your bathroom. With all of the features, this bathroom fan should be a top contender on your list. Safe & Efficient: With 70-CFM ventilation fan, this unit will provide plenty of steam removal as well as optimal performance in just about any bathroom you can imagine. On top of that, the built-in 100-watt lighting will provide you with an even, clean light to brighten your entire bathroom. Built-in Heater: The built-in 1500-watt heater is a feature that you will simply love. The electronically balanced blower makes sure that all of the heat omitted is sent flowing evenly throughout the entire room. On top of that, this unit also features a unique built-in safety measure that will reset itself automatically for thermal protection. Easy Installation: This is one fan that you will easily be able to install all by yourself. The 4-inch duct size is one of the most common ones for homes with regular sized bathrooms and will normally fit perfectly. Being built to install on ceilings with a thickness of 3-4 inches, this fan is as universal as they get. Built-In Nightlight: Not only is this fan going to keep the steam from causing any damage to your bathroom, provide heat if you decide you need it and become your bathroom’s main light, but it also has a built-in nightlight as well. Home to a 7-watt nightlight, you will have no problem keeping the light off with those middle of the night visits to your bathroom. Stylish Exterior: This 4-function ceiling fan that combines a heater, ventilation, main light, and nightlight doesn’t stop there. It is also very stylish with a die-cast grill that sports a pebble-textured bezel. With a glass lens of 8-inches, this unit will stand out in your bathroom, as well as handle any of your heating, lighting or ventilation needs. After testing this fan out, I was actually very impressed. The heater was a nice feature to use when it was required, and the light that was put off was more than enough to light the entire bathroom. The night-light was probably my favorite feature, as I hate turning on the light in the middle of the night to use the toilet. I’m more than sure that you feel the same way. In fact, whenever I do have to turn on the light after sleeping, it makes it almost impossible for me to go back to sleep within the net 30 minutes or so. This is exactly why the built-in night-light is my absolute favorite feature of this bathroom-ceiling fan. As far as the fan working, it also worked really well. While it didn’t’ perform as some of the bigger bathroom fans I tested, combined with all the other features, the slower ventilation was barely noticed. What I didn’t like about this bathroom fan and what I would change if I could, would be how noisy it was. Yes, all the other features are great, but the fan was very noisy and as far as I’m concerned, the quieter the ceiling fans the better. Will Last A Lifetime: This is one ceiling bathroom fan that you will be glad you have. With up to 30,000 hours of continuous run life, this fan will more than likely be going strong well after you have moved on – to another house that is. It features a completely enclosed condenser motor that helps extend its life to go on and on. When you think of this fan, think of the energizer bunny. Will Never Rust Or Tarnish: I can only imagine what you would think if you got out of the shower one day and looked up to see a ceiling fan that was tarnished and starting to rust. You would more than likely be very upset. That will not be a problem here as this fan has been coated with a rustproof paint treatment that is on a solid galvanized housing. Built-In Damper: Another key feature on the Panasonic FV-15VQ5 WhisperCeiling 150 CFM Ceiling Mounted Fan is the built-in damper that helps to prevent any type of backdraft from occurring. On top of that, there is also a built-in thermal fuse protector. Quiet And Powerful: While small in size than some of the other ceiling bathroom fans on the market, this fan is much more powerful than you would think. The 150 CFM bathroom ceiling fan will not only keep your bathroom steam free, but also it will do so very quietly. The strong motor is one of the quietest bathroom ceiling fans available. Energy STAR Certified: Since this is a Panasonic bathroom ventilation fan, you can guarantee that it is ENERGY STAR certified according to any and all guidelines. This fan, as well as the other ENERGY STAR ventilation fans must meet the strictest of parameters that have been set by the US Environmental Protection Agency (EPA). This means that you can rest assured that this fan is pretty awesome. I thought that this bathroom ventilation fan was very effective for its size. While I have a little bit of a larger bathroom, or at least larger than most regular sized bathrooms, this fan was still able to do a great job of making sure there wasn’t an overflow of steam. While it wasn’t silent, it was still pretty quiet and for the most part was unnoticed other than a minor bathroom air fan sound. One of the things that I did like most about this bathroom-ceiling fan was the fact that it was a flush mount to the ceiling. Personally, I enjoy the flush mount ceiling ventilation fans over the other ones, and this one checked that box. Another candidate for the best bathroom exhaust fan. If I was able to change anything on this fan, I would like to change how much power it had. While it did do its job and kept the bathroom pretty clear, the windows and mirror would always fog up. Other than that, this fan is pretty good. Having proper ventilation and light throughout your entire bathroom is an absolute must. That is exactly why the Broan 655 Heater and Heater Bath Fan with Light Combination is the perfect addition to your bathroom whether your home is new or old. Will Compliment Any Décor: This is one bathroom ventilation fan and light combo that you will be glad to have in your home. With a designer styled white polymeric grille that will complement virtually any décor imaginable, from the style sense, this is a must-have. Fan And Heater Functions: Having both a bathroom fan and bathroom heater function, this is a truly a convenience that you won’t be able to live without. And if that weren’t enough, the fan and heater can be used independently, or they can also be used together at the same time. Built-In Bright Bathroom Light: With a built-in 100-watt light capacity light socket (the bulb is not included), this bathroom ventilation fan will not only keep the steam out and heat the bathroom for you, but it will also make sure that there is plenty of light for you to see everything that is going on during your shower, bath, teeth brushing, or anything else that you do in your bathroom. Fast And Efficient Heater: With a 1300-watt heater, this is one fan, heater, light combo unit that is going to be able to heat your bathroom extremely quickly. And with the special built-in even heat distribution, you can rest assured that the heat will be evenly distributed each and every time you need it. Easy Installation: Another nice about the Broan 655 Heater and Heater Bath Fan with Light Combination is that it is one of the easier ceiling bathroom fans to install. You would think a unit with all of these great features would be a nightmare to put in. However, this one is actually a really smooth install job. As far as a bathroom ventilation fan, bathroom heater, and bathroom light combination unit goes, this one was actually pretty good. While it wasn’t a flush mount unit like I enjoy, it did do its job very efficiently. The heat this unit put out was nice while not being overpowering and making the bathroom too hot. The light function works great and makes sure that you aren’t stubbing your toes on any cabinets or anything like that. As for the ventilation, it did its job well enough that you weren’t walking out of the shower not being able to see 2 feet in front of you. While there was still fog on the mirrors and windows after showers, the entire bathroom was pretty clear and not full of steam. If I could change anything about this fan, heater, light combo unit, it would be to make it a little stronger. Don’t get me wrong, everything on this unit worked great. However, compared to some of the other units tested, I would want to make the fan on this unit a bit stronger. The Panasonic FV-11VQL6 Ventilation Fan/Light Combination 110 CFM is a time-tested ceiling fan and light combo unit that was built with quiet operation in mind. Quiet Operation: This fan was designed with one thing in mind, to not be heard. With a completely enclosed condenser motor paired with its double-tapered blower to quickly and quietly move air faster than you would expect, this bathroom ceiling fan exceeds expectations. Uses Less Energy To Operate: This particular Panasonic bathroom-ceiling fan uses less energy to operate both the ventilation fan, as well as the built-in light. But don’t worry, even though this fan uses much less energy to operate than many of the other brands, it is still able to move almost twice the volume of air. Longer Operating Life: Since this bathroom-ceiling fan and light combo unit uses much less energy than other ventilation fans, the life of this fan is much longer. With less energy being used to operate itself, the fan is able to run much cooler, which in turn makes it last longer and be much less likely to overheat. This is also good as it helps to prevent the fan motor from overheating. High-Efficiency Light: This ceiling fan unit has been equipped with a high-efficiency CFL lamp that is up to code with all of the latest standards. With two ENERGY STAR lamps that put off more than enough light to brighten even the larger bathrooms, there is also a nightlight that will help you when less light is required. 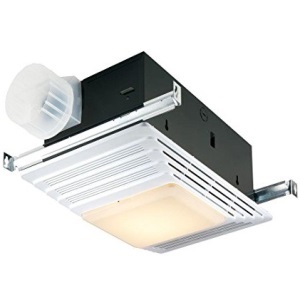 Easy Installation: With an included adapter for both 4” and 6” air ducts, there is enough flexibility for this fan and light combo unit to be installed in any bathroom. And with a double hanger-bar system that expands up to 24 inches, you are able to position this fan just about anywhere you want to. After trying this fan, I would say that it pretty much lives up to all of its claims. Being able to install this ceiling fan just about anywhere in the bathroom is very convenient as many times the fans are in the weirdest spots. So this is a feature that I really enjoyed. Another nice feature was the included vent adapters. This also helped to make the installation process much easier than many of the other fans that didn’t have this feature. As for the fan, it worked well and was surprisingly efficient for its small size. While it wasn’t loud by any means, it also wasn’t the quietest ceiling fan either. The light was bright and did its job of lighting up the entire bathroom. The one thing that I would change is to switch out the bulbs to incandescent bulbs. The unit comes with compact fluorescent and can’t be switched out for any other type of bulbs. 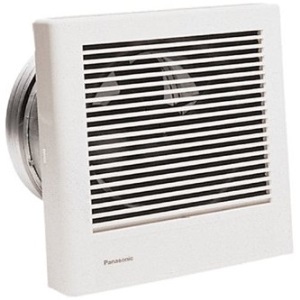 The Panasonic FV-08WQ1 WhisperWall 70 CFM Wall Mounted Fan is a wall-mounted fan, not a ceiling mounted one. It has been designed specifically for a bathroom where having a ceiling mounted ventilation fan is impractical. Designed To Move More Air: This wall-mounted fan was designed to move more air quicker. While ceiling fans are usually better as steam always rises, this wall-mounted fan will give any ceiling fan a run for its money. With a blower wheel that was specifically designed for drawing air in both sides, this fan allows more air to enter, which in turn means more steam will be removed. Continuous Trouble Free Operation: Since this wall-mounted fan was designed with only the highest quality parts, the life expectancy on this is quite impressive. You will experience continuous, trouble-free use for many years to come. And if the high-quality parts weren’t enough, this fan also features permanently lubricated motors for even more fan longevity. Designed To Be Energy Efficient: With a capacitor motor that has been designed for a life of extended service and reduced energy consumption, it also includes a built-in thermal-cutoff for extra motor safety. Stylish Flush Mount Design: The last thing that you want on your bathroom wall is a fan that sticks out taking up precious bathroom space. This is the reason ceiling mounted ventilation fans are so much more popular. However, this is not the case with this wall-mounted fan. With a grille that can easily be detached from the main unit, this unit is just about as flush mounted as you can get when it comes to a wall-mounted ventilation fan. Never Worry About Rusting: The last thing you want your bathroom ventilation fan to do is to become rusted or have a tarnished look. That is definitely not the case here as the heavy-gauge zinc galvanized steel fan housing has also been painted to make sure that rust will never become a concern. My initial thought of this 70 CFM wall mounted bathroom ventilation fan was that it actually looked pretty good for a wall-mounted fan. While I have always been a fan of the ceiling mounted fans as steam goes up, this wall mount does a really good job of keeping the bathroom steam free. In fact, this was the first wall mount fan that I have ever tested, and I’m not afraid to say that I was thoroughly impressed. Not only was the fan powerful enough to get the job done, but also it wasn’t as noisy as I thought it was going to be either. While you can hear it, it actually isn’t very loud, and you will easily forget that your fan is even on. For a wall mount ventilation fan, this is definitely going to be on the top of my list and another candidate for the best bathroom fan. What I would like to change, however, would to maybe add a light. With many of the other ventilation fans being tested including built-in lights, it would be nice to see that feature on this wall-mounted fan as well. 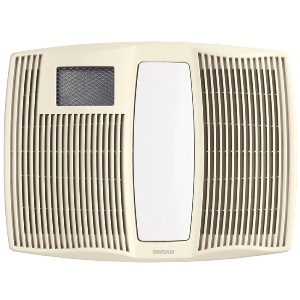 Being another ‘all-in-one’ bathroom fan from Broan, the QTX110HL Ultra Silent Series Bath Fan with Heater and Light is a triple threat. With a high-powered fan operating at 110 CFM, a bright 120-watt light that consists of two 60-watt incandescent bulbs and a built-in heater, this fan can do it all. Easy Installation: With anti-vibration mounting brackets and being adjustable for up to 24 inches, this is one bathroom ventilation fan, light, heater combo that is much easier to install than you would think. Now factor in the included 6-inch duct connector and you’ll have this fan up and running in no time. Safe And Efficient: With a fan motor that was designed for non-stop continuous operation, the permanently lubricated motor is able to function independently of the ventilator. And with the 1500-watts, quiet, high-performance blower wheel, the heater is able to efficiently heat your bathroom while not missing any of the ‘cold’ spots. Bright And Efficient Lighting: Coming with a light lens that you can easily snap in and out of place, the two 60-watt bulbs (not included) give off a combined 120-watts of brightness. And if that weren’t enough, the 7-watt night-light will help you see in the dark without having to turn on the main lights. Sturdy Construction: Made out of a rugged galvanized steel housing, this unit was designed to last. The steel housing will help prevent any rust from forming, while the white polymeric grill adds a finishing touch that anyone would be proud to have in his or her bathroom. Very Quiet Operation: This bathroom ventilation fan offers a very rare combination of extremely quiet operation and enough power to keep your bathroom steam free. Now top that off with a quiet, efficient heater and this fan will keep your bathroom warm and steam-free with nearly silent operation. After having gotten this Broan QTX110HL Ultra Silent Series Bath Fan with Heater and Light installed pretty quickly, I was surprised at how powerful the fan was. While it is 110 CFM and many of the other fans tested are only 70 CFM, I wasn’t expecting the difference in power. As for the heater, it worked as described and was able to warm my bathroom pretty evenly without really missing any areas. And the light, after I got the bulbs in place, was more than bright enough to turn my bathroom into daytime. While both the fan and heater were not silent, they were not what I would classify as loud either. All in all, I would say that this is a pretty good bathroom ventilation fan, heater, and light combo unit. The only thing that could be better is the plastic grille cover. I’m not a scientist or professor, but I imagine that after a couple of years that the heating element would start to wear on the plastic. To clarify, this did not happen to me, but after playing with it, I can foresee something like that happening down the road. The Panasonic FV-11VHL2 WhisperWarm 110 CFM Ceiling Mounted Fan/Heat/Light-Night-Light Combination unit is an all-in-one ceiling mounted bathroom ventilation fan that does it all. Boasting ‘whisper’ technology, this fan claims to be able to do everything you need in the bathroom. Ceiling Mount Fan And Heater: If you are looking to get some room-warming heat in your bathroom quickly, then this is the fan you’ve been looking for. Heating up in less than a minute, this ceiling fan does a great job of keeping your bathroom warm, as well as clearing away any steam with its 110 CFM ventilation fan. Smaller And Quitter: Whether you live in an old home or a newer one, you don’t want to have a bulky ceiling fan that sounds like an airplane is in your bathroom. That is where the WhisperWarm FV-11VHL2 will come in handy. The smaller, but still powerful design will make sure that it stays unnoticed, while the quiet fan will help keep it nice tranquil while still getting the job done. High-Tech Heater: Featuring a 1400 watt that is housed in a durable, steel sheathed heating element; the WhisperWarm includes thermal fuse protection for the motor, as well as an extra 3-level heater safety device to make sure that there is never any overheating. Long Life And Reduced Costs: Your bathroom ventilation fan and heater should never be a worry that you have on your mind. And with this bathroom fan, it won’t be. This fan was designed to use less energy and move larger amounts of air than other similar sized ventilation fans. Due to the lower energy demand, the fan will run much cooler than other, which will prevent any overheating or motor failure. Plus, this motor comes with a built-in thermal cutoff fuse. Lighting Efficiency: Incorporating the most efficient CFL lights available, this unit easily passes all of the latest standards and codes. The two 13 watt ENERGY STAR lights are able to squeeze out more light per watt making it easy to brighten up even the darkest of bathrooms. And with the built-in 4-watt night-light, bumping into the sink counter or toilet will become a thing of the past. This fan was actually one of my favorite ones. Not only does it able to handle any amount of steam with its 110 CFL vent fan, but also the heater works well and is quick to take any chill out of the bathroom, which is nice. The light that is put off is also pretty bright and easily lit up my entire bathroom. Installation of the unit was pretty simple as well, with no real hiccups of any kind. My favorite part though had to be the nightlight. While other bathroom ventilation fans had brighter nightlights, I enjoyed this one because it was just enough for me to see what I was doing without being too bright. As for the loudness of the fan, it was definitely quieter than many of the other fans I tested. While it this fan wasn’t very loud, with a name like ‘WhisperWarm,’ I would expect this fan to be practically silent. Unfortunately, it was not practically silent, and I feel that this is an area where improvement could definitely be made. 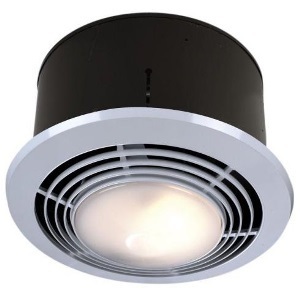 The Broan 744 Recessed Bulb Fan and Light is a great little 70 CFM ventilation fan that also houses a 75-watt light. What sets this particular bathroom ventilation fan and light combo apart from all of the others is that it’s recessed. Provides A Stylish Ventilation Fan And Light Combo: One of the best features of this unit is that it is recessed. This means that you can easily have more than one if you wanted to and not have it look weird. Having two or three ceiling mounted fans in your bathroom would look a little strange. However, if they were recessed, it would actually look like they were supposed to be there. High-Efficiency Fan: While the unit is a bit smaller than some of the other ceiling ventilation fans, this high-efficiency centrifugal fan can deliver a whopping 70 CDM, being HVI-certified 1.5 Sones (Sones are a measurement of sound. A Sone of 1 would be equivalent to the hum of a silent refrigerator). Can Be Used Anywhere In The Bathroom: While this recessed fan/light combo can literally be installed anywhere in your bathroom to provide even more light and faster ventilation, it works best when installed over the shower or bathtub. Being UL Listed for use over both the shower and bathtubs, the GFCI protected branch circuit make sure that no amount of steam will bother this unit from working great. Bright Light Output: With the use of a 75-watt light bulb, this unit is able to put off enough light to brighten the area it is installed. Need more light? Simply install multiple units in the larger bathroom to make sure that there is more than enough light. And as an added bonus, you will also increase the ventilation power of your bathroom as well. Built For Efficiency: While this ventilation fan is on the smaller size with only a 4” duct opening, it makes up for its small size in power. But since the unit is smaller, it uses less energy to operate it. And if that weren’t enough, the additional wall control switches (not included) can be used to control the unit even more. While the installation process was somewhat different from the other ventilation fans being reviewed as this unit is recessed into the ceiling, it wasn’t that bad. And once it was in, wow! The light worked great and put off plenty of light, and the fan worked great as well. In fact, unless the fan is actually on, you will more than likely forget that this light actually is a fan as well. Or at least that is what happened to me. And what I liked best about this particular unit was that it is an easy piece to enhance the entire look of your bathroom. I think the recessed lighting look definitely adds a little ‘wow’ factor, especially when compared to other bathroom ceiling ventilation fans that are typically more noticeable. This one could also be the potential best bathroom exhaust fan. What I wasn’t as impressed with was that the ventilation aspect of the unit was somewhat slower than most of the others that were tested. If Broan were able to increase the fans power a little bit more, this one would be tough to beat. 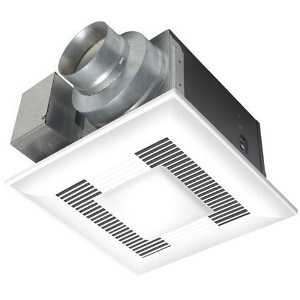 Depending on the theme and style of your bathroom, the Hunter 81021 Ventilation Victorian Bathroom Exhaust Fan and Light Combination definitely has the potential to put it over the top. With an elegant, fancy look and feel, this fan will definitely become the centerpiece of your bathroom. Strong But Silent Operation: With a large 90 CFM ventilation fan, this Victorian-style exhaust fan is much quieter than many similar sized models. At just 2.5 Sones, this fan will hardly be noticeable when you are getting things done in the bathroom. Unique Victorian Themed Design: Most bathroom ceiling ventilation fans look just like that, a bathroom ceiling ventilation fan. This is not the case with this Victorian Themed one, however. With its unique style, the traditional chrome and porcelain design will definitely be the first thing you and your guests notice upon walking into the bathroom. Can Be Used Anywhere: Being ETL damp listed, this decorative bathroom ceiling fan not just works well, but can be placed over the shower or bathtub as well. This gives you the power to put the fan wherever you want to increase the look of your bathroom. Will Make Your Bathroom Shine: With the help of two 60-watt A-15 bulbs that are not included, this ventilation fan/light combo will easily light up your entire bathroom with the flick of a switch. 5-Year Limited Warranty: This is one feature that is not often seen when it comes to bathroom ventilation ceiling fans. A 5-year limited manufacturer’s warranty. This means that you know the Hunter Company stands behind their products and is willing to put their money where their mouth is. This is the bathroom ventilation fan that definitely stuck out the most to me out of all the other bathroom fan reviews. The design alone makes you want to not just have one in every bathroom, but then the kitchen, the living room, and even the bedrooms. Anyways, looks aside, this fan worked great, and the ventilation was good enough to keep most of the steam from building up. The light was bright and did light up the entire bathroom all by itself. While the fan is noticeable when it’s on, it isn’t loud enough to bother you. It simply sounds like a bathroom ventilation fan. The one area that could definitely use improvement would be the fan placement. While the fan seems strong enough, I think that the Victorian design makes the fan work a little less than optimal. 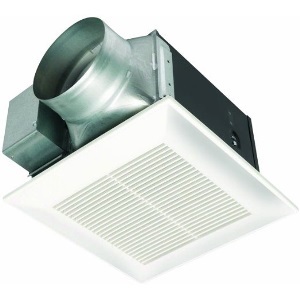 an inline exhaust fan is a type of fan that mounts inline (either connected to or inside ducting) and is used for purposes of extraction. An inline exhaust fan is normally located inside the roof space or attic as opposed to directly on the ceiling or plasterboard. It is normally farther away from the bathroom. While not always the best exhaust fan for bathroom choice, a ceiling mounted fan is any fan that you mount onto the ceiling for ventilation. This means that the ventilation fan is right there in the bathroom and connects to a duct that will remove the air extracted from the fan to outside the house. A wall-mounted fan is very similar to a ceiling mounted fan, the main difference being that a wall mounted fan is mounted on the wall. While it still needs to be hooked up to a duct to remove the air from the bathroom, it is the perfect option for a ventilation fan if the ceiling is not a practical spot for one. A combination fan is a ventilation fan that is also combined with another feature. For example, the additional feature could be a built-in heater, a light, or even both. These can be much more functional and practical depending on the size of your bathroom and the features that you want in it. When you decide that you are ready for a bathroom exhaust fan with a light, there are several different things that you need to keep in mind. 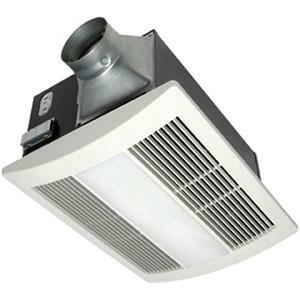 Here are some things to consider while choosing a bathroom exhaust fan with a light. When selecting a bathroom exhaust fan with a built-in light, you want to be sure that you choose the one that best fits your needs. If you don’t have any space on your ceiling to put a fan/light combo unit, chances are a ceiling fan isn’t going to be the right type of fan for you. In this case, you may want to consider a wall-mounted fan. So choose the type of fan that will best fit your bathroom. Make sure that when you are choosing a bathroom fan that you choose one that will fit the bathroom. A typical rule of thumb is to have more power than you need as opposed to less power than you need. Since the whole purpose of your fan and light are to brighten and remove air, make sure that you get a fan and light combo that will be able to do so efficiently without having to strain itself. Unless you are going to have a professional come in and install your bathroom fan and light combo unit, you want one that is going to be easy for you to install. The worst case scenario is that you get started on the install and then realize you don’t know how to connect the light and have to go find a professional anyways. 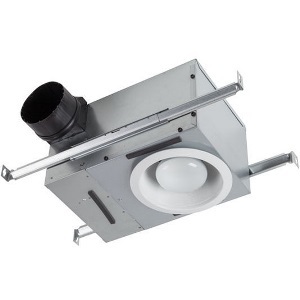 So be sure to find a bathroom exhaust fan and light combo that is easy for you to install. An enclosed condenser motor will last much longer than a fan without an enclosed condenser motor. 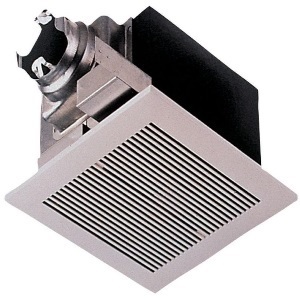 If you want to do yourself a major favor and not have to worry about your bathroom exhaust fan needing to be replaced any time soon, then the enclosed condenser motor is an absolute must. You want to be sure and choose a fan and light combo that is powerful enough to get the job done but isn’t loud. A bathroom ventilation fan is supposed to be quiet so you don’t notice that it’s there. This is an important feature as the last thing you want is for air to be back drafted into the bathroom. The whole goal here is to get the steam and air out of the bathroom, and a built-in damper will make sure that this is the only scenario you run into. Nobody likes to have his or her hard earned money flow out of the bathroom exhaust fan. That is why your bathroom exhaust fan needs to be an energy saving model that will help reduce the cost of running it, not increase it. When your bathroom exhaust fan has an improved blade design, it will become more efficient. The more efficient your fan is, the better it will do its job, the longer it will last, and it will require less energy to do the same amount of work. Built-In Heater – This will help to take the chill out of the air to help you get more comfortable quicker. 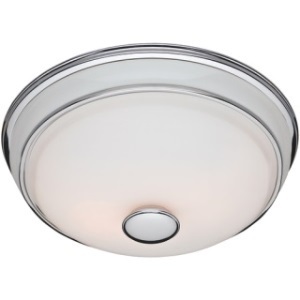 Light – This will clear up clutter on your bathroom ceiling and create a much cleaner look. Plus it will help light the bathroom even better than normal. Motion Sensor Activation – This feature will make it so you don’t even need to use a switch. As soon as you are sensed, the unit will turn on by itself. Humidity Sensing – A nice little feature that will sense how much humidity is in the bathroom and can then adjust the fan to accommodate the required workload. Thermal-Cutoff Device – This is an added safety feature that will help to protect your fan from becoming overloaded and overheated. This is a must if you plan on your bathroom fan lasting a long time. Bluetooth Wireless Technology – You will be able to link to your phone so that you are able to stream music, change the color of the bathroom light and have one of the coolest bathroom exhaust fans on the block. While a bathroom exhaust fan is not a necessity to have, it definitely makes for a much better overall experience when in the bathroom. With the removal excess steam, enough light to brighten the entire room and a heater to keep the chill away, a good quality bathroom exhaust fan is almost a must. By using this best bathroom exhaust fan, you will be able to find the perfect bathroom exhaust fan to fit your individual needs, as well as your bathroom and it’s style. Trust me when I say that your future self says thank you.